The Governor Wolf Historical Society is pleased to announce the return of Colonial Crafts classes. The “GWHS Summer Institute of Colonial Arts” will be held on Thursday May 30 and Friday May 31. There are half day, full day, and two day classes. See below for descriptions. Classes are all make-and-take where students will go home with a completed Colonial treasure! Breakfast and lunch will be included in the class fee, served up by Macungie Mountain Herb Farm. Classes will be held in all three historic buildings at 6600 Jacksonville Rd., Bath PA 18014 and will run from 8:30am to 4:30pm. 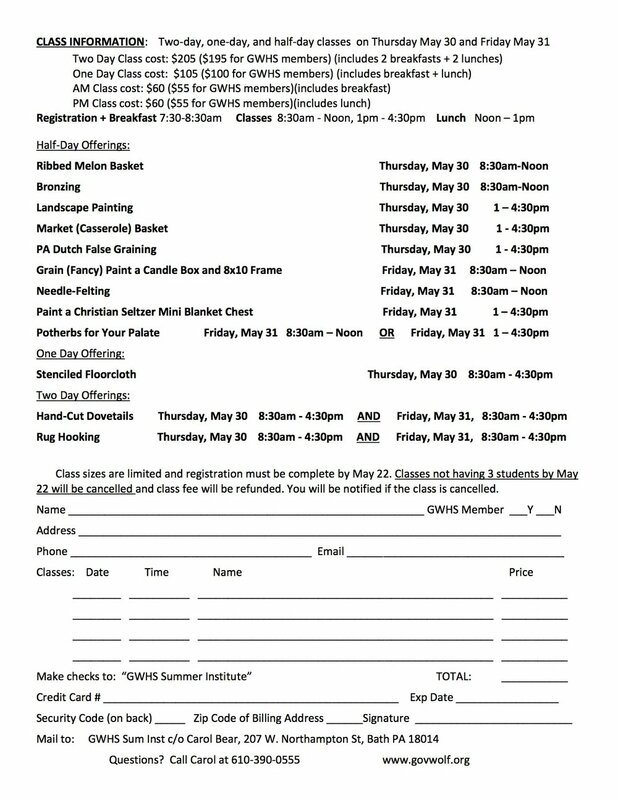 Classes are limited and registration must be received by May 22. Full listing of classes and registration information below. Please print registration sheet.